Political Action Committees or PAC’s, first began in 1944 and since then have become an increasingly popular way for groups to promote a shared ideology. The term “Political Action Committee” refers to two leading types—connected and non-connected. PAC’s may be subject to federal and state registration requirements, depending on their core focus. Federal PACs must register with the Federal Election Commission (FEC), while State PACs must register with the state’s Secretary of State. Spending and fundraising requirements may vary, depending on whether the PAC is focused on Federal, State, or Local elections. It is recommended that PACs stay up to date with changes in election law and fundraising limitations. A connected PAC is one that is tied to a specific corporation, trade association, or labor organization and is referred to as a “Separate Segregated Fund” (SSF). SSFs may only solicit contributions from individuals associated with their connected or sponsoring organization. For example, a SSF tied to a trade union may only solicit contributions from the members of the trade union and their families. An SSF must register within 10 days of inception by filing a “Statement of Organization” with the FEC or Secretary of State. SSF’s do not have to disclose any donations or expenditures made for it on the behalf of its sponsoring/connected organization, only what was spent or donated directly to the PAC. The PAC name must also include the full name of the connected or sponsoring organization. The PAC may not include in its name the name of any candidate. Non-Connected PAC’s, as the name suggests, is one that is not tied to any specific organization and is financially independent. Non-connected PAC’s may solicit contributions from the general public and must disclose all contributions and expenditures. Non-connected PAC’s must register with the FEC or Secretary of State within 10 days after raising or spending in excess of $1,000 dollars. The PAC may not include in its name the name of any candidate. Each PAC must designate a treasurer to file all donation transactions, keep track of funds raised and budgets. PACs must keep accurate records regarding all spending and contributions and submit reports electronically. Reports may be submitted monthly or quarterly, PAC’s that file quarterly may be required to file certain pre- and post- election reports depending on their activity. State rules for the formation of PAC vary, but all require that a PAC appoint a treasurer. In New York, a PAC is required to register, only once, prior to receiving or expending any funds and within 5 days after the selection of a treasure and a depository. The depository must be authorized to do business in New York State and be physically located in the state. An original signature is required on all forms. NY State also requires PACs to file, electronically, expenditure and fund raising reports monthly or quarterly. Texas requires a PAC to designate whether it is a connected or non-connected PAC, requiring a different form for each. They require the PAC to register with the Texas Ethic Commission before accepting contributions or expending funds in excess of $500. California requires registering within 10 days of receiving $1000 in contributions and includes a $50 registration fee that is paid annually. 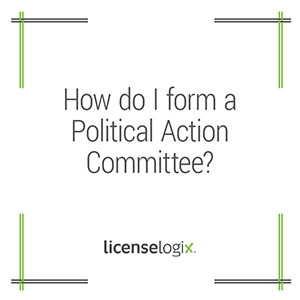 Licenselogix will file the necessary registration to ensure that your PAC is in compliance with federal, state, and local laws. Our skilled account managers will identify any supplemental information needed, collecting and completing all paperwork and applications, and monitoring the process to ensure swift approval so that you can focus on growing your PAC. Licenselogix will also alert you when the financial reports must be submitted and if any changes to the reports arise. To get a free quote today, fill out the box on the right or call us at 1-800-292-0909.